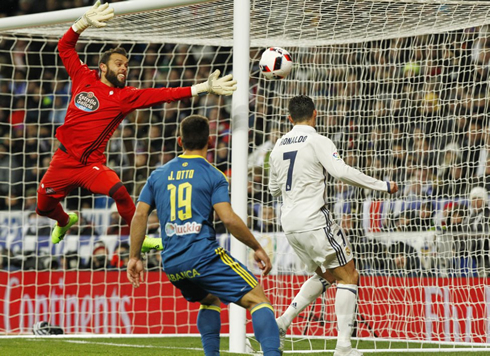 Real Madrid and Celta de Vigo clashed at the Bernabéu for the Copa del Rey quarter-finals first leg and the visitors surprised everyone with a 1-2 win. The two sides meet again next for the return leg, this time in Vigo, at the Balaídos stadium. Real Madrid failed to bounce back from last weekend's league defeat against Sevilla and ended up being beaten again tonight, this time against Celta de Vigo in the Copa del Rey quarter-finals first leg. 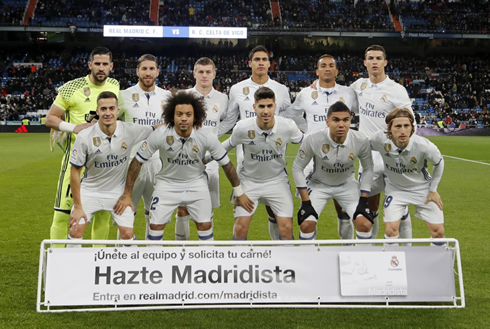 The Merengues saw their opponents leaving the Bernabéu with a 2-1 win and are now in serious risk of getting knocked out of the competition. The hosts scored first by Iago Aspas, but it would take Marcelo just 5 minutes to send the game back to square one with a cool finish. Celta de Vigo, however, were determined to upset Madrid tonight and recovered their 1-goal lead right in the minute after, with a goal from Jonny Castro. Can Madrid turn it around next week? Well, after 40 games unbeaten, Real Madrid have now lost two in a row, though with this one being in the first leg of the Copa del Rey, there is still enough time to recover. A poor first half from Ronaldo, who has really started 2017 off in rut, it's similar to how he started the season, but it's becoming apparent that these occurrences are more and more frequent. With Carvajal injured for what looks to be a month, a lot seems to be riding on Danilo for the foreseeable future and the Brazilian right back did not inspire confidence today at all. It's always a worry when a team finally loses after being so used to winning for so long - What will happen next? Will the wheels fall off the bus? It's a conundrum that varies per team. Last year, we saw Barcelona suffer the same fate, after a stretch where they looked unbeatable, they looked like they couldn't win a game no matter how hard they tried. Every single attacker seems to be woefully out of form. Early on I mentioned Ronaldo, but Benzema wasn't much better in the second half. In fact, the Frenchman's shocking miss with a mere 7 minutes left in the match left a lot to be desired and frankly, summed up the entire night for Madrid. It certainly felt like Real Madrid grossly underestimated Celta and paid the price in the end. The good news is that Madrid can rectify this in a week's time away at the Balaidos. The bad news is that it certainly seems like the magic is gone. Madrid do look a little fatigued and flashbacks to the 2014-2015 season, when Madrid's brilliant first half was undone by poor performances and fatigue in the second half of the season, seem too familiar. Attackers: Asensio, Lucas Vázquez, Cristiano Ronaldo. Cristiano Ronaldo next game is a La Liga fixture, on January 21 of 2017 against Malaga. You can watch Juventus live stream, Real Madrid vs Malaga, Real Sociedad vs Barcelona, Stoke City vs Manchester United, Manchester City vs Tottenham, and Freiburg vs Bayern Munich, all matches provided from our live soccer game pages.